We’ll look through the Visitor Center exhibits to learn about the park’s history and the unique plants and animals of the area. We’ll also hike the Floodplain Trail that goes through a tunnel cave as we look for native flora and fauna. We'll spend the night south of Tallahassee near St. Marks National Wildlife Refuge (SMNWR). The next morning, we’ll leave early for SMNWR. Our focus is on migrating monarch butterflies. Monarchs from across the eastern United States gather here in the fall before crossing the Gulf of Mexico on their migratory route to Mexico for the winter. Conditions permitting, we'll meet a biologist near St. Marks lighthouse where we'll experience butterfly collection and tagging first-hand. On our last trip, we collected over 1,000 monarchs for tagging! We'll also seine in the Gulf of Mexico and study the marine specimens that we collect there. After the field activities, we're off for the Visitor Center where we'll discover more about the refuge from the educational exhibits. We’ll also look in the nature-oriented gift shop/book store. After lunch, we'll leave for Gainesville where we'll visit Florida Museum of Natural History's Butterfly Rainforest and see hundreds of free-flying butterflies in a beautiful tropical setting. 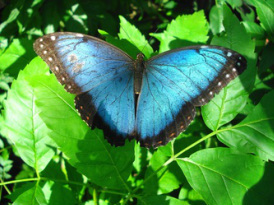 There are also thousands of butterfly and moth specimens and photographs. The "Rearing Lab" lets us observe the life cycle of the butterfly close up. We can also observe scientists and researchers through glass windows as they work in the world's largest research facility devoted to Lepidoptera. Participants should be able to hike short distances easily. It is very important that children demonstrate the ability and willingness to follow adult instructions and also be physically able to keep up with the group throughout the two days. Minimum number: 25. Space is limited to 10 hotel rooms. Minimum age: Six years or first grade due to activities planned for the two days. Cost: Cost varies for children and adults, depending on number in room (see registration form). Cost includes creation tour guides, hotel accommodations, meals from day 1 lunch through day 2 lunch, all entrance fees, cave tour, and educational handouts. Our Florida Panhandle Creation Tour is usually scheduled on a Friday and Saturday. The best time for migrating monarchs is near the end of October or the beginning of November. We try to work around FSU and Florida A&M home football games since hotels are usually booked to capacity during those weekends and more expensive. To visit our website calendar and check for available dates or currently scheduled trips, click here. See info about our last Panhandle Creation Tour (overnighter) on Fri.-Sat., Nov. 4-5, 2016. OPEN TO ALL. Scheduled by The Classical ﻿﻿School﻿﻿, Orlando and Science Partners.